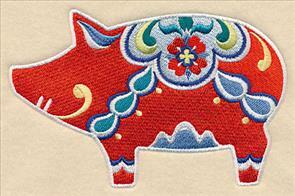 Celebrate traditional Swedish folk art with all new designs inspired by Scandinavia! 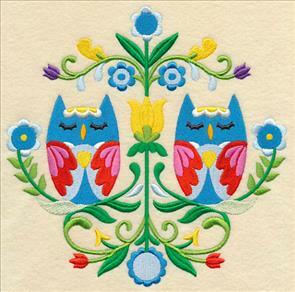 Classic Nordic motifs, eye-catching symmetry, and simple flourishes give these folk art designs beauty and grace. 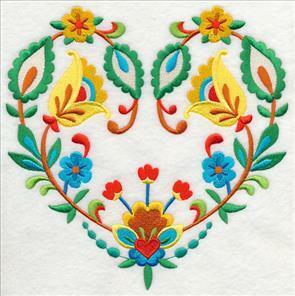 The traditional Swedish art style was originally used for hand-painting furniture, leather tooling, and textiles, but is currently a staple in apparel, linens, and other household accessories. 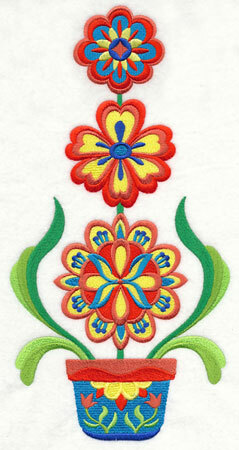 Try it on your embroidery! 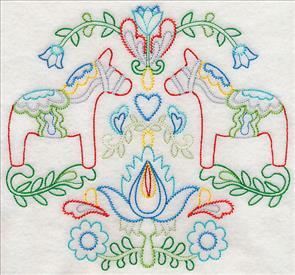 Traditional Dala horse designs, a Scandinavian stack, flowers, hearts, and more await in this new collection of Swedish folk art designs. 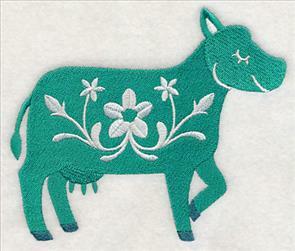 Stitch a horse on the edge of a towel or blanket, or try a twist on Dala in a pack of animal silhouettes! 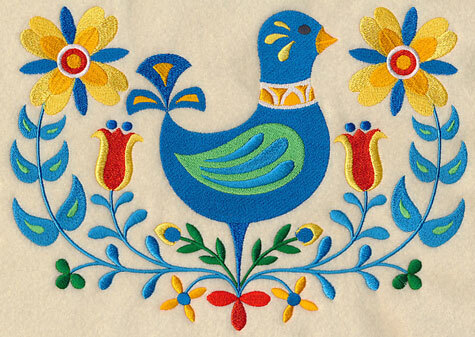 Scroll down the page to see these Swedish-inspired designs! Get picnic-ready with a clever placemat with a special pocket for paper plates, plastic silverware, and napkins! 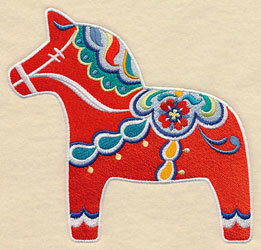 A Dala horse, or Dalecarlian horse, is a traditional carved and painted wooden horse statue from Sweden. 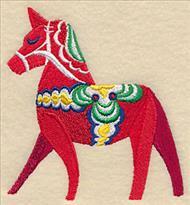 The horses started as a toy for children, but are now widely accepted as a symbol of the country as a whole. 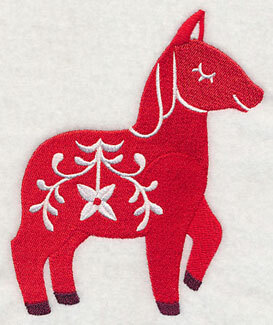 Here we've recreated the Dala horse in an embroidery design, as well as a few other farm friends! 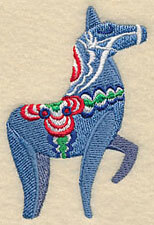 6.97" x 5.70" and 5.77" x 4.71" and 4.39" x 3.59"
The Dala horse is most commonly depicted with a stout frame and bright red paint with a detailed harness in white, green, yellow, and blue. 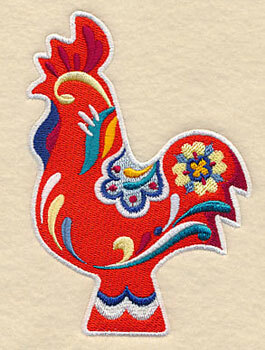 The rooster and hen designs below embody this traditional style of Dala. Try them on kitchen decor, such as towels, aprons, or oven mitts. 3.40" x 4.64" and 2.81" x 3.84" and 2.15" x 2.92"
Woodcarvers would generally make the Dala toys for their children, and in the 19th century the small horses became a bartering item, and later a prevalent motif on home decor. The statuettes today are still handcrafted, made of pine, and feature the pattern from over 150 years ago. 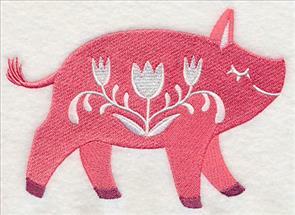 Stitch a pig and sheep to finish off this Swedish folk art collection of designs -- they're perfect for pillows, quilts, kitchen decor, and more! 5.90" x 4.39" and 4.90" x 3.65" and 3.73" x 2.78"
Pick your favorite Dala animal, or get the entire collection for one low price! 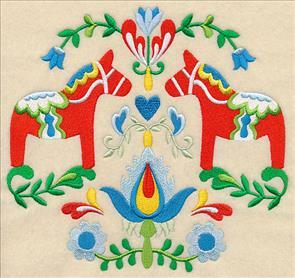 Swedish folk art is known for its symmetry, use of color, and inclusion of traditional cultural motifs, like the Dala horse in the design below. 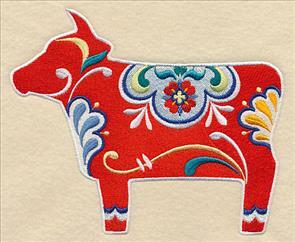 Each of the folk art designs is also available in the "vintage" style of embroidery. 7.80" x 7.25" and 7.00" x 6.51"
6.30" x 5.86" and 5.21" x 4.84"
7.79" x 7.27" and 7.01" x 6.54"
6.31" x 5.89" and 5.23" x 4.88"
Stitch-filled embroidery works well with a large variety of textiles, while light and airy vintage-style designs work best with smooth, neutral fabrics. Use fabrics such as quilter's cotton, linen, denim, twill, and canvas. 7.76" x 7.80" and 6.86" x 6.90"
5.83" x 5.86" and 4.85" x 4.87"
7.69" x 7.88" and 6.90" x 7.09"
5.85" x 6.02" and 4.84" x 4.99"
Add these brilliant birds to a wide variety of embroidery projects, such as tote bags, quilts, pillows, and so much more! The vibrant design is a great way to add a pop of color to your home decor. 7.80" x 7.34" and 6.91" x 6.50"
6.23" x 5.85" and 5.16" x 4.85"
7.79" x 7.38" and 6.89" x 6.53"
6.22" x 5.89" and 5.16" x 4.89"
In addition to classic Scandinavian motifs, some of these folk art designs feature fun, non-traditional elements, such as the cupcakes in the designs below. 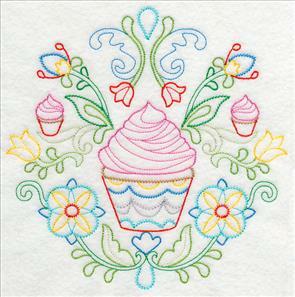 Stitch these tasty designs on aprons, wall hangings, and kitchen towels. 7.80" x 7.78" and 6.90" x 6.89"
5.86" x 5.85" and 4.86" x 4.85"
7.79" x 7.79" and 6.89" x 6.89"
5.88" x 5.89" and 4.87" x 4.89"
Swedish folk art relies on simple patterns to express elegance and sophistication. 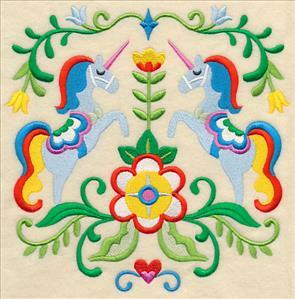 The intricate detailing and overall sense of harmony gives the motifs a tasteful air (even when decked out with unicorns!). 7.80" x 7.64" and 7.05" x 6.90"
5.99" x 5.86" and 4.97" x 4.87"
7.81" x 7.59" and 7.11" x 6.90"
6.03" x 5.85" and 5.01" x 4.86"
Overall, a sense of whimsy and delight is also prevalent in Swedish folk art, as it reflects the friendliness of their culture and countryside. 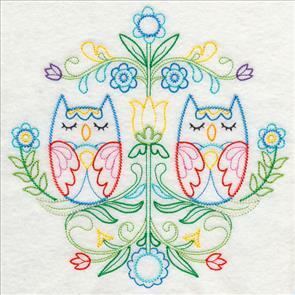 The colorful owls in these designs embody that innate lightheartedness. 7.80" x 7.73" and 6.97" x 6.91"
5.92" x 5.87" and 4.92" x 4.87"
7.80" x 7.75" and 6.96" x 6.91"
5.90" x 5.86" and 4.92" x 4.88"
Try all the Swedish folk art designs! Design packs below include a stitch-filled version and vintage version -- get one of each for fabulous project possibilities! 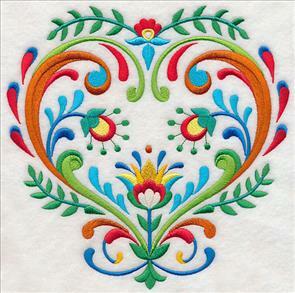 Elegant swirls and flowers give these Swedish folk art hearts a sweet, sophisticated style. 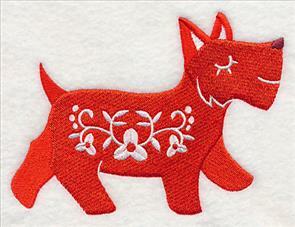 Stitch them on pillows, quilt blocks, aprons, jackets, sweatshirts, tote bags, and more! 7.81" x 7.76" and 6.95" x 6.90"
7.76" x 7.80" and 6.90" x 6.93"
5.86" x 5.88" and 4.84" x 4.87"
Use all three of the hearts together -- stitch the trio on a rectangular pillow, as wall hangings, or on a table runner. 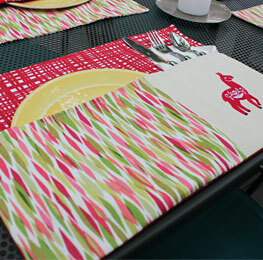 The colors and styles let each of the designs stand out on their own or coordinate together as your project demands. 7.79" x 7.74" and 6.93" x 6.89" and 5.89" x 5.86" and 4.89" x 4.85" and 3.86" x 3.83"
A beautiful topiary features three brilliant blooms all stitched in classic folk art style. 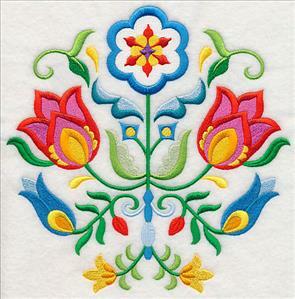 The red, yellow, and blue used in the design are all reminiscent of traditional Swedish motifs. 5.99" x 11.76" and 4.79" x 9.41" and 3.98" x 7.81" and 3.50" x 6.86"
Graceful, stem-like lines and beautiful flowers add a hint of fancy to this bird design. 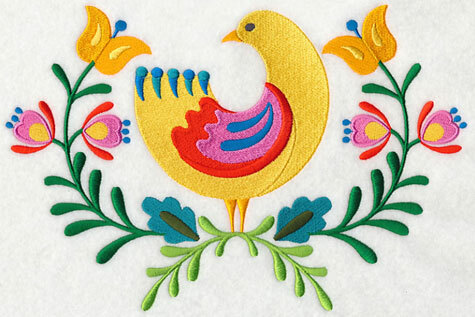 The embroidery embraces the Swedish tendency to use wildlife-inspired motifs in their folk art, such as the bird and flowers here. 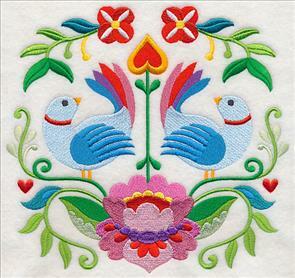 9.69" x 6.84" and 8.28" x 5.86" and 7.81" x 5.52" and 6.86" x 4.85" and 3.86" x 2.73"
Stitch this colorful border with the bird design above for a stunning pair of folk art designs. 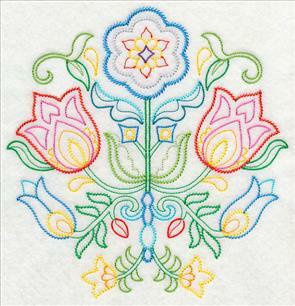 The motifs are terrific for stitching on a napkin and placemat combo or a pillowcase and bed linens duo. 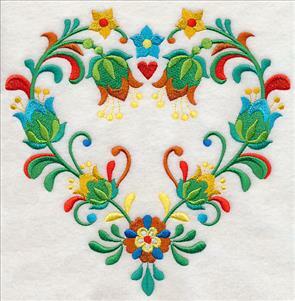 8.54" x 2.90" and 7.24" x 2.46" and 6.83" x 2.32" and 6.00" x 2.33" and 3.42" x 1.17"
Embroidered Swedish art features a bold mix of order and playfulness. The simplicity of the designs embody a certain level of control, while the vibrancy and flourishes offer a more lively aspect. 10.38" x 6.90" and 8.80" x 5.85" and 7.80" x 5.18" and 6.86" x 4.56" and 3.86" x 2.56"
The energetic folk art bird motif above also has a matching border design that's terrific for embroidery projects. 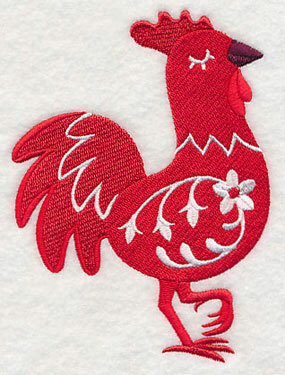 The design is an eye-catching addition when sprinkled down a t-shirt, sewn along a tablecloth, or added to an apron. 8.90" x 3.00" and 7.55" x 2.55" and 6.82" x 2.30" and 6.00" x 2.23" and 3.42" x 1.16"
Love the Dala style, but too traditional for your taste? 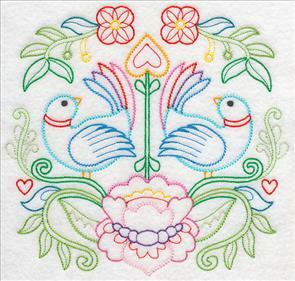 Try stitching a fun and friendly version of the classic Swedish folk art instead! 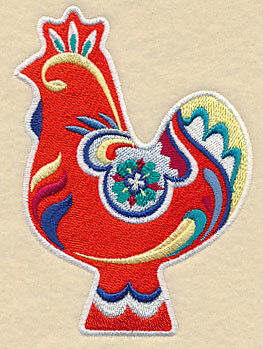 Stitch a "Dala Llama" on a tote bag, or a vibrant rooster on an apron -- the colorful silhouettes are terrific additions to embroidery projects. 4.07" x 5.58" and 2.81" x 3.86"
Each of the Swedish animal silhouettes features intricate detailing that nods to the traditional Dala design. 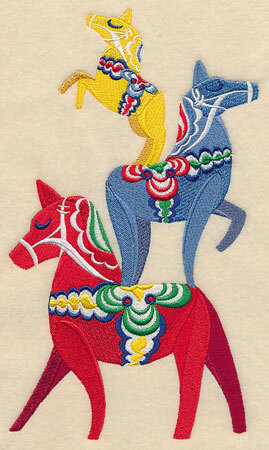 Bright colors also set the designs apart from other animals silhouettes, such as the vivid red and lavender in these horse and fox designs. 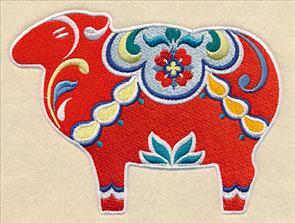 5.69" x 3.90" and 3.87" x 2.65"
The cheerful and charming animals are terrific when stitched together on a quilt or kitchen decor, or on their own (think pillows, table linens, tote bags, towels, and more!). Pair your favorites, or stitch the whole series! 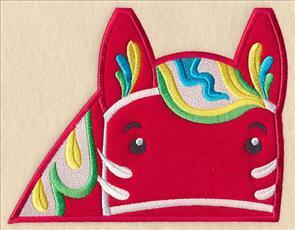 5.77" x 4.86" and 3.87" x 3.26"
Each of the non-traditional Dala animals are a great choice when stitching for kids decor. We especially like the idea of adding the designs to a baby blanket, onesie, bib, burp cloth, pillow, or backpack! 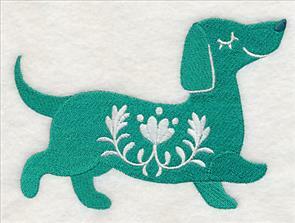 5.61" x 4.39" and 3.87" x 3.02"
A Scottie dog and dachshund finish off the collection of dala silhouettes in style. 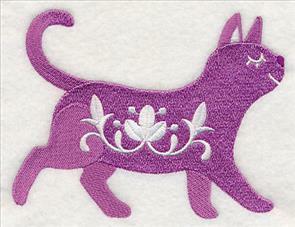 Stitch the furry friends on blankets, pillows, wall hangings, and more. 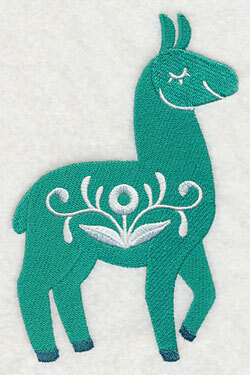 5.51" x 3.87" and 3.87" x 2.71"
Celebrate classic Dala design with a twist -- these cute critters are adorable additions to embroidery projects. Pick your faves by using the links above, or get all the designs in one design pack. Get three times the Scandinavian charm with a towering stack of colorful Dala horses -- one bucking, one prancing, and one posing. 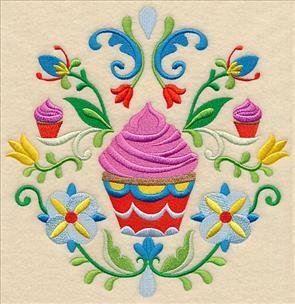 The stacked-up design is the perfect choice for stitching on towels, totes, aprons, jackets, and so much more! 5.49" x 9.40" and 4.02" x 6.88"
Each of the horses featured in the Swedish stack are also available on their own. 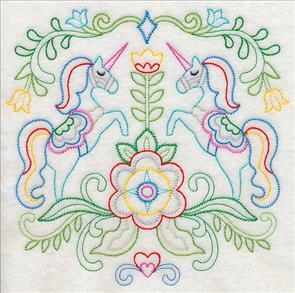 Stitch them to accompany the stack design, such as on a pillowcase and matching quilt, or a jacket back and pocket embellishment. 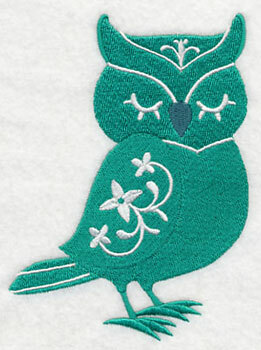 Animals on the Edge are great additions to the bottom of towels, blankets, bibs, and more! 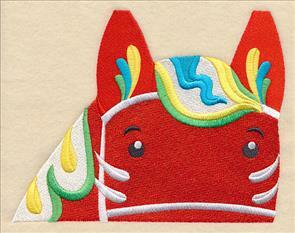 This version featuring a Dala horse was requested by Sarah, and we loved her creative idea. It comes in two versions, too! 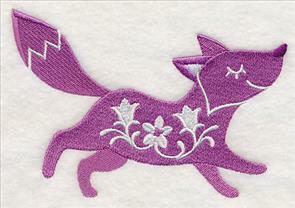 Get the tutorials for stitching the stitch-filled design and the applique version. Thanks for the idea, Sarah! 7.65" x 5.88" and 6.34" x 4.87" and 3.90" x 3.01"
Do you have an idea or suggestion for a new design? Let us know! Send an email with a description of your idea to support@emblibrary.com.